Has speaking in public ever been a fear of yours? One of our Yoga Teacher Trainees was dead-scared of speaking in front of people – now 8 months through the program that has changed a great deal for her. Read on to hear about Jess’ journey in finding her voice. Months ago (I can’t believe it’s already been that long) we started our teacher training program by introducing ourselves and by sharing an item that was particularly special to us. We sat in a circle and shared our names for the very first time. When the spotlight hit me, I shared that public speaking, or speaking in any group setting really, made me extremely uncomfortable. It was something I was consciously working on, but it still proved to be a bit of a hurdle. I’d brought a mala necklace with a smoky quartz stone, that I had recently started wearing, that acted as a constant reminder that I could open my mind to connect with my voice. Even just sharing this with the group made my palms sweat, my heart race and my face hot. Explaining the discomfort made me even more uncomfortable- shocking, right? I knew that this program would challenge me in more ways than one, but I also know that they very best kind of learning and growth comes when you are uncomfortable. So here I was, ready to learn. I have to say that the process of opening up didn’t come easy. Each YTT weekend pushed me to grow a little bit more. The community we have developed is so supportive, warm and connected; it seems impossible to fail when so many people want you and everyone else around you, to succeed. On one of the early weekend sessions, we were given the opportunity to teach in front of the group. Every bit of me wanted to bolt from class… to jump on the nearest bus headed for home without signing up. I didn’t want to teach, or be the leader, but I knew if I kept pushing it off my fear would only continue to grow. I could hardly handle it then; I didn’t want to see what it would become. It wasn’t as if we were tempting fate, or performing brain surgery, but I hardly slept the previous night. I could think of nothing but teaching and the anxiety that came along with it. I remind you that we were only asked to teach one single pose… Imagine if they had asked us to do something really crazy- like teach a whole class! We started in silent meditation that morning (which I usually enjoy). Normally, it feels like there is a sense of magic in the room. You can’t see it or speak of it, but you can sit and let it resonate with you. Well that morning, there was no magic or peaceful serenity. There was fire in my belly and gremlins in my head. I couldn’t concentrate on anything but the fact that I would have to stand in front of the group and speak. Wearing my mala as a reminder, I took my spot in the front of the room. My legs were shaking so badly I thought I’d lost my kneecaps. Guess what happened next? I taught the pose. Nailed it, really. The voice that came out was shaky… but it came out. These kinds of opportunities kept coming up over the next couple of months. Even though taking them made me uncomfortable, I kept doing it. I was learning to teach yoga, but I was also being united with a piece of myself I’d yet to meet. Becoming more vocal wasn’t just an issue in a teaching atmosphere. It was a problem in all aspects of my life. If it wasn’t because I was shy or didn’t want to attract attention… it was because I wanted to go with the flow or make things easier. As my voice began to be uncovered in our training, it also surfaced at work and at home with friends and family. There is a unique sense of confidence that surfaces when you value your own thoughts and ideas and choose to share them with the world. In one of our more recent weekend sessions, I shared with the group that I felt like I had finally found my voice. I felt connected and strong and thanked them because they each played a huge part in my personal revelation. Throughout this whole time, I was still wearing my mala everyday. (A constant reminder to keep talking, to keep opening my mind and facing challenges wholeheartedly.) The day that I shared this news with the YTT group I lost my mala at the park. Somehow it fell off but, of course, a fellow YTT found it and brought it back to the studio. In some mystery, between the park and the studio, the necklace fell apart. It was almost as if it wasn’t meant to come back to me. 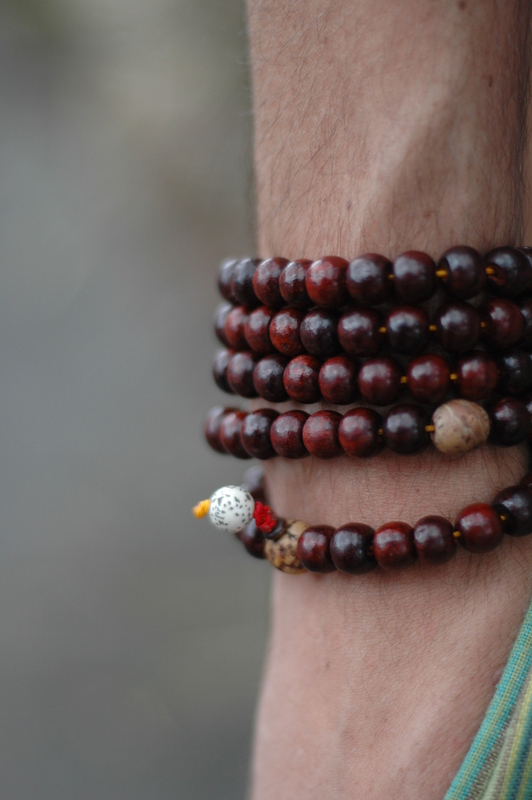 I’ve heard people say that when malas break it represents a completed intention or karmic breakthrough. So, maybe, that is what happened to me? It doesn’t really matter what you call it- I discovered my voice and I now know it needs to be heard. 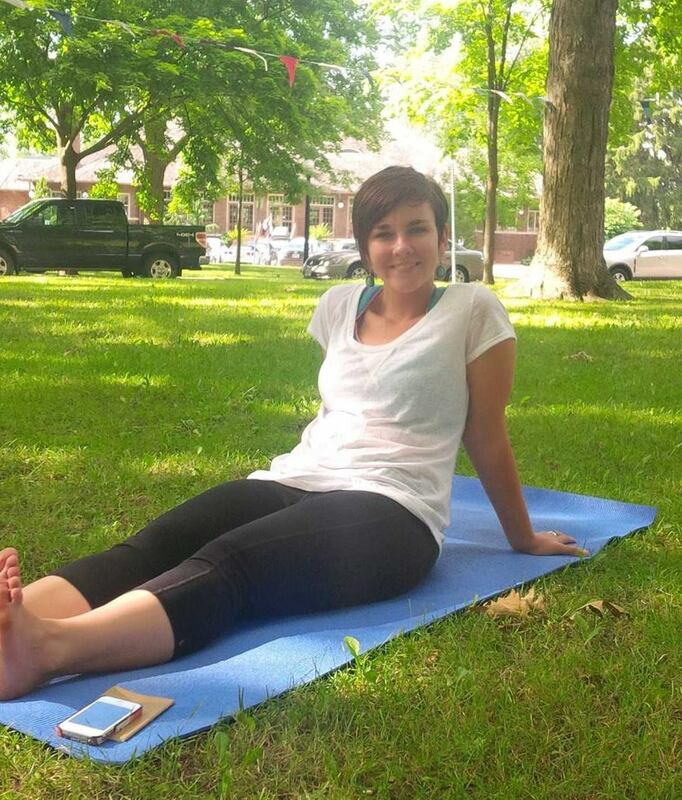 Jess DeBrouwer is in our 2014 Yoga Teacher Training Program. When not taking classes at the studio or practicing at home she can be found wandering around the Kitchener Market or making cauliflower hot wings in the kitchen. Jess loves big hugs, warm scarves and hot cups of tea. I know just how this feels … even though people peg me as just the opposite. Finding and claiming one’s voice (literally and philosophically) is a huge thing.